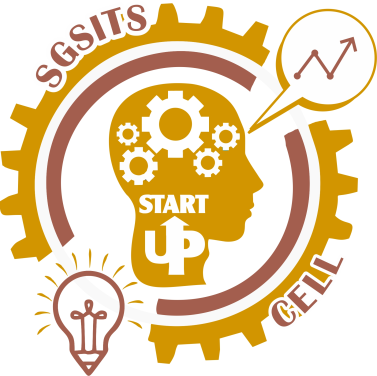 The Start-up cell in SGSITS is established on 8th February 2018. The cell with its team of mentors, coordinators and E-cell student volunteers of the institute is meant for nurturing the potential start-up ideas that will cater need of both tech and non-tech solution to various social, economic and industrial problems of the nation. Although, the ecosystem for the same exists in the institute as the number of tech and non tech student club activities are already functioning, the Startup cell is meant to coordinate and renovate these activities with vision of flagship scheme Government of India i.e. “Start-up India”. Creating a vibrant and dynamic Startup Ecosystem in Technical Institutions by playing a role of pre-incubator to promote & facilitate the support system to innovative and entrepreneurial students and faculties to convert their innovative ideas/problems to tech-solution with a feasible business model stage. Handholding of Student start-ups through connecting and forming various student entrepreneurial activity clubs ( Idea clubs, Innovation Clubs, Start-up Clubs) to come up with tech solutions for the problems from Industry, Society, and Market to generate Ideas/Proof of Concepts (PoCs) and helping them to get converted to Prototypes and mentor them to develop business models ready. Therefore, creating a strong pipeline of quality and quantity tech based potential start-ups for incubators industry to take further. Identifying students of Entrepreneurial tendency through General Entrepreneurship Tendency Test (GETT) and various competitions. Entrepreneurial awareness through panel discussions, talk shows, workshops etc.